Arizona QB did not deserve this bad luck. Multiple news sources are reporting that Arizona Cardinals QB Carson Palmer has torn the ACL in his left knee. Palmer will be undergoing an MRI as soon as possible to confirm a diagnosis. 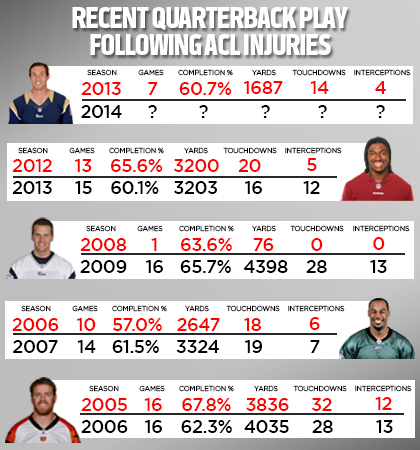 If it’s a complete tear of the ligament, Palmer would miss the rest of this season and some of the 2015-16 season. Palmer was injured on a sack by Rams safety Mark Barron in the fourth quarter of Sunday’s game. The former Heisman trophy winner from USC was just two days after he signed a three-year contract extension worth a reported $50 million, including $20.5 million guaranteed. The Cardinals were playing some the best football in the league. Palmer had thrown 11 touchdowns and was completing nearly 65% of his passes. His team was in first place in the NFC West with an 8-1 record. Head Coach Bruce Arians told reporters that backup QB Drew Stanton is ready to start Week 11. Stanton replaced Palmer in the fourth quarter. In four previous games, Stanton completed 46 of 93 attempts for 614 yards, three touchdowns, zero interceptions and an 81.6 passer rating. Palmer leading the offense and team towards a Super Bowl run would’ve been great to see. FTS wishes Palmer a speedy recovery. For more on the story click on ESPN. What are his prospects for success when he returns? Thanks to Chat Sports and AZCardinals.com for the infographic.